Available for selection by these badge holders: All Access, DOC NYC PRO Gold Pass, DOC NYC PRO Silver Pass, DOC NYC PRO Bronze Pass. To buy a pass click here. Each day of the 2018 festival features two distinct, subject-themed programming tracks for DOC NYC PRO. Each programming track has its own set of panels. To reserve a spot to any panel in advance, passholders must click the title of the individual panel below and make their redemption selection. Morning Manifestos are not ticketed and are open to all DOC NYC passholders on a first-come, first-served basis. 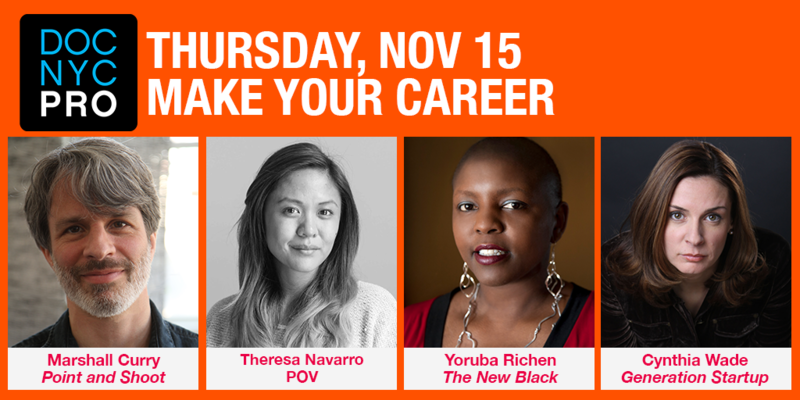 Explore ways to create a lasting, sustainable career in documentary film in this series of conversations with filmmakers and industry veterans. BREAKFAST 9:00AM – 10:00AM Open to all badge holders. Yoruba Richen (The New Black) shares her thoughts on getting films made. Open to all badge holders on first-come basis. Beth Levison (Hazel Pictures), Loira Limbal (Firelight Media, Estilo Hip Hop), Theresa Navarro (POV) and others share how grants are being supplemented by a variety of helpful resources and programs in support of a filmmaker’s long-term career. Moderated by Andrea Swift (NYFA). Liza Burnett Fefferman (MTV, VH1 and Logo), Jonathan Bogarin (306 Hollywood), Jenner Furst (TIME: The Kalief Browder Story) and others discuss what steps you can take to utilize your projects not only monetarily, but also to create your next opportunities. Moderated by Juliane Dressner (Personal Statement). John Sloss (Cinetic Media), Allison Polly (Creators League Studio), Sara Bernstein (Imagine Documentaries) and Jared Shulman (ACE Content) explore how brands and digital media companies will affect the future of film and television financing and distribution. The full schedule of 2018 PRO programs can be found here.